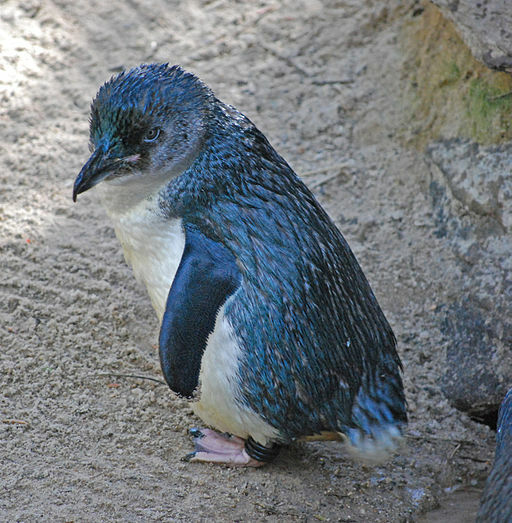 It was the middle of the night when researchers snuck up to nesting penguins on the coast of New Zealand and stole the eggs out from under them. Placing the warm eggs in an incubator for safekeeping, they slid artificial eggs back under the penguins' bodies. Each replacement egg held a heart monitor that was now pressed against a parent penguin's skin. Then the researchers crept away and prepared to give the penguins a bit of a scare. Little blue penguins (also called fairy penguins, or simply little penguins) are the world's smallest and bluest penguins. They live in burrows on the southern coasts of Australia and New Zealand. During the breeding season, males and females pair off and share the responsibility of keeping their eggs warm. These penguins are both territorial and chatty. They "bray" to announce themselves, and seem to recognize other individuals' calls. If a territorial dispute between two little blue penguins comes to a scuffle, the winner gives a final bray of victory at the fight's conclusion. Researchers in New Zealand wanted to know if these announcements of victory--called "triumph displays"--are followed by local penguins like the nightly news. Do penguins inside their burrows eavesdrop on tiffs going on around them, listen for the voice of the winner, and then make sure to give that champion penguin a little extra room? Led by Solveig Mouterde at the University of Waikata, a group of researchers carried out the stealthy egg swaps described above. They conducted their experiment at night, when the birds are active on land; each nest was occupied by either a lone male or lone female penguin who was tending the eggs while his or her partner fished at sea. After sneaking away and giving the penguins some time to settle down with their new, electronic offspring, the researchers began broadcasting the sound of penguin brays from speakers. They used recordings taken from a distant colony of penguins, so the individuals in this study wouldn't recognize any voices. Each penguin heard a short soap opera of penguin calls: First, an exchange of territorial squawks between two male penguin voices. Then, the sounds of a scuffle ("i.e. flipper slapping"). After the fight, a final bray of victory from one of the two penguins. Finally, five minutes later, the distinctive squawk of either the winner or loser penguin--but now right outside the listening penguin's burrow, as if approaching. Once the researchers swapped the heart-monitor eggs back out for the penguins' real eggs, they studied their recordings to see how penguins reacted to the nighttime drama. They saw that female nest-sitters had elevated heart rates when either of the recorded penguins "approached" their burrows. Males' responses, though, depended on whose voice it was. If the approaching voice matched that of the winner in the mock fight they'd just overheard, male penguins kept quiet and their heart rates became elevated. But if they heard the voice of the loser, male penguins stayed calm. They were also more likely to squawk right back at the potential intruder, as if to say, "Back off, I know you're not so tough!" It seems that little blue penguins can not only recognize other individuals' voices, but eavesdrop intelligently on the interactions happening outside their burrows. After two penguins have tussled over territory, it benefits the winner to give a victorious squawk: He lets other penguins know that they shouldn't mess with him, and saves himself the effort of having to fight another day. It also benefits nosy neighbor penguins to listen in on a scuffle. By paying attention to who wins and loses fights, they can avoid the king of the ring and save themselves from an embarrassing trouncing. These ten-inch-tall penguins can follow their neighborhood social dynamics just like an eavesdropping human would. That's not bad for a bird that can't even tell when it's babysitting a piece of plastic. That's cool. This was a really cool read!